Stygere is made of a soft knit with a hand painted soft sculpture face. His hair is embroidery cotton. He wears a removable outfit of a soft stretch knit with a satin one-shoulder cape. 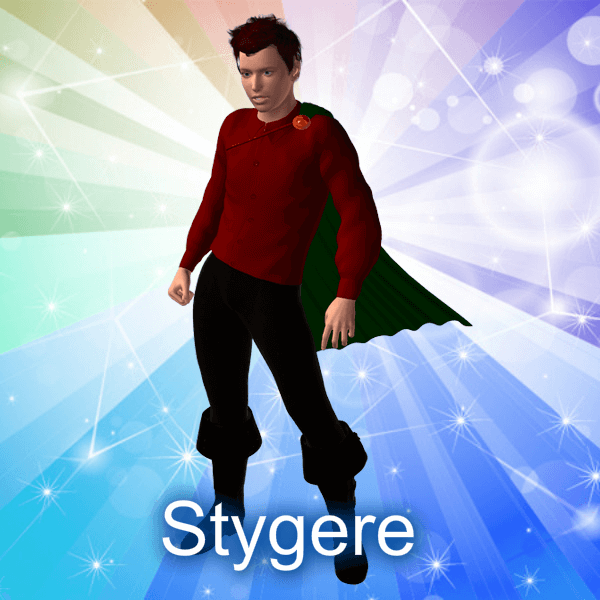 Stygere might be the most docile of the Keres. He doesn’t agree with his mother and sisters’ methods of governing the planet and destroying it – he just isn’t dumb enough to try openly disagreeing with them. The last time he tried disagreeing with them, they nearly killed him. In his eyes, that’s reason enough to keep his thoughts to himself. He secretly hopes Dream Angel will chase his mother and sisters away. He’s been around their bickering constantly, but fears the consequences of leaving. So, he’ll stay back from a fight and even drop clues for Larissa or anyone else he knows is allied with Dream Angel and her friends. In his own small way, he tries to help the heroes, but keeps it subtle to avoid suspicion. If he thinks the situation might turn on him, he’ll join the fight and make it look like he’s on their side. Since he’s talked in the shadows with Larissa a few times, Dream Angel knows of his feelings and thus understands he’ll pull his punches so all she has to do is play along and he’ll continue to help.